The Office may be the best written show on Television. The tension that the show creates is par to none. Last night, we were introduced to "Creed Thoughts," a blog from one of the Duner-Mifflin employees. I was bored and thought I would do a Google search to see if it actually might be out there. JACKPOT! 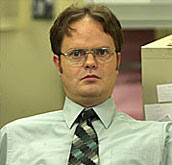 Not only did I find Creed's blog, but...yes...DWIGHT K. SCHRUTE! Interesting comparison with Dwight K. Schrute and my cousin...both fascinated with the art of the ninja! Have the Church Hoppers Found A Home?